The large open living room is equipped with a flat screen tv, cd player, ipod docking station, and comfortable furnishings. 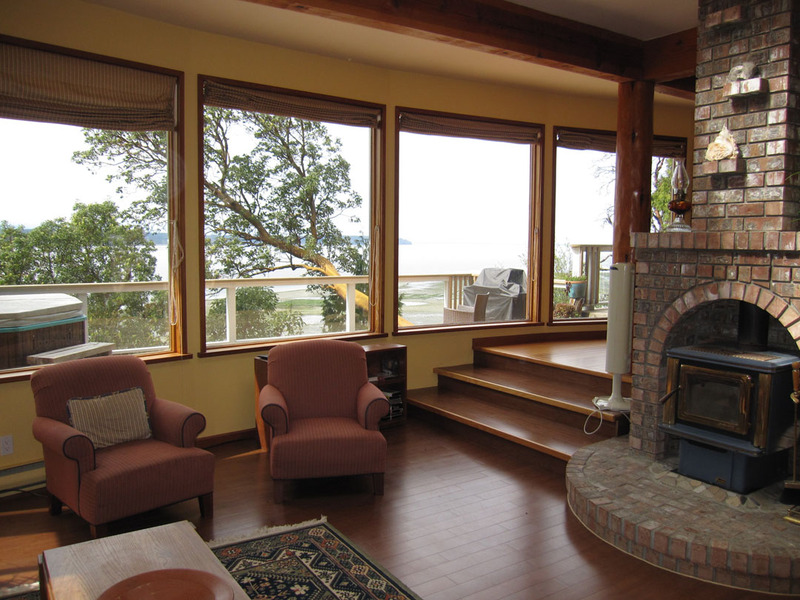 If there's a chill in the air, cozy up in front of the Pacific Energy wood burning stove and watch the eagles soar outside. Local artworks are displayed throughout the house. There is a washer and dryer for your use. (Note: As everywhere on Hornby, we practice water conservation). A telephone and wireless internet are provided for your use. The bright, Alf Bangert crafted kitchen is fully equipped, complete with a million dollar view. The open plan is great for entertaining. There is an LG double oven electric stove, up and down fridge/freezer, dishwasher, & microwave. Quality small appliances, pots, pans, dishes, glasses, and cutlery are provided. 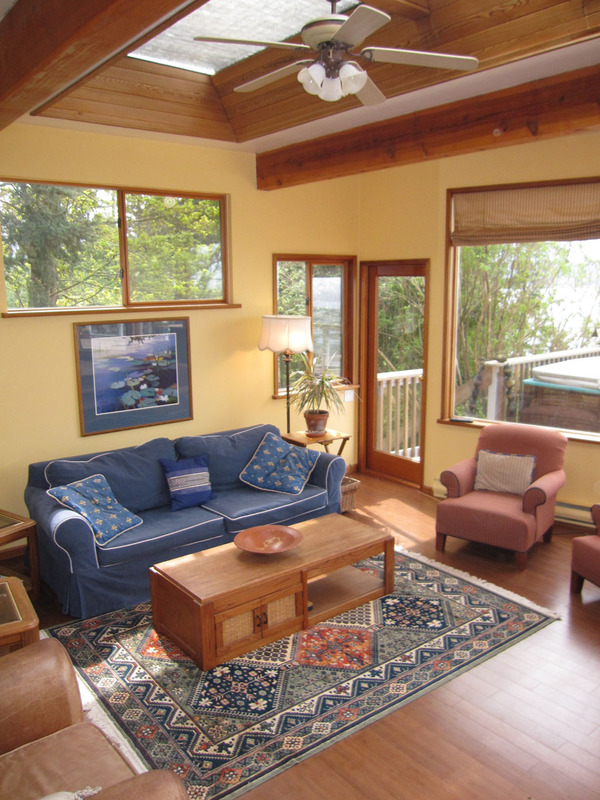 A wall of picture windows and the large outdoor deck bring together indoor living and the appreciation of the natural setting and spectacular vista. A generous inside dining area, with seating for eight, is located immediately off the kitchen. It features a Paul Wullum stained glass Hornby seascape chandelier. An outdoor dining area, is located on the wooden deck, which spans the front of the house. The deck is designed for summer BBQ's and entertaining. Soak in the Clearwater hot tub, while watching the eagles soar, enjoying gazing at the stars or marvelling at the vistas. Many a comment has been made about our "million dollar view". 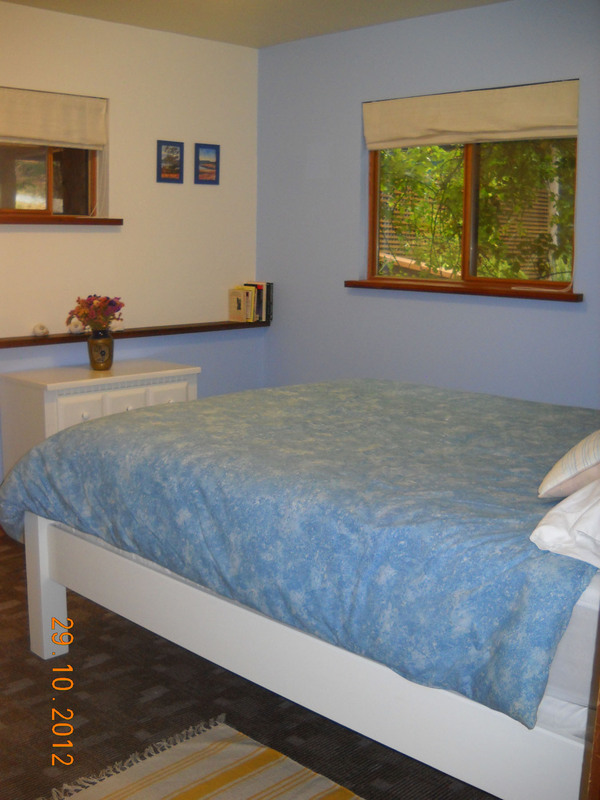 Also on the main level are two bedrooms, both with queen sized beds. 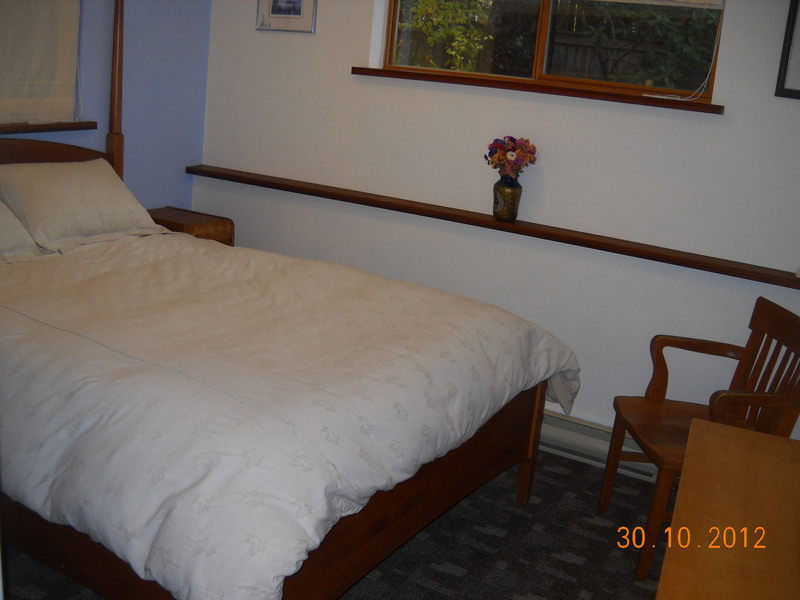 In the office there's an upper single bed, suitable for a mid aged child. There is also a full bathroom and a laundry room. All, good quality, linens are provided. Walk upstairs to the master suite, which has a full en-suite bathroom, and a high quality, queen sized bed. Turn on the electric fireplace and delight in some quiet solitude in your own personal sitting area. Or enjoy the fresh ocean air while relaxing on your private rooftop deck. To complete the perfect vacation, a personal chef can be made available with prior arrangement. Contact Dawn at customgourmetchef@shaw.ca or visit her website at http://www.customgourmetchef.com Please let her know that Karen at the Beach House referred you.